I walk gingerly along the catwalk. The boards bend and sway beneath my feet with each step. 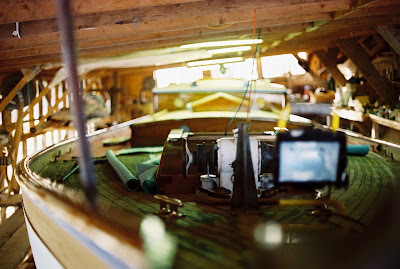 I move along the edge of the boat, the smell of varnish heavy in the air. "Careful not to raise any dust," she calls out from the other side of the boat where she is laying on the final brush strokes. "That varnish is still fresh. Don't want to have to start over." I nod in agreement. I hold each rafter I pass under, still unable to gauge my weight against the give of the boards. I hold firmly. But carefully. She smiles at my caution, wiping her hands on a clean corner of a towel she has pulled from the waste of her pants. "So, you built this," I state, the magnitude of what I am seeing still settling in. The sides are newly painted, too. White, with royal blue trim. It reminds me of the boats I had seen docked along the coastline of the small fishing towns I had visited in Greece twenty years ago, my friends and I invited by men who spoke no English to sit at their tables and share bowls of olives and bottles of Greek wine, the invitations made obvious by toothy smiles and broad sweeping gestures over the empty chairs beside them. We responded each time with one of the very few Greek words we knew, "Epharisto," and sat most afternoons, eating and drinking, listening to these men talk, their voices arching and falling from somewhere we had no access to. The cafes faced the shores where octopi fisherman unloaded their catch. One man outside one cafe tenderized his octopi on a large stone. He smiled when he noticed us watching. He winked then slapped a new octopus down against the stone. He continued this way until he had made his way through his entire catch, emptying one basket and filling the other. She walks around the bow, catching up to me quickly, her feet sure of themselves over the graying boards. The board we stand on together bows under our weight, then settles. "See?" she asks leaning toward me, pointing, her shoulder grazing mine. I lean forward, too, trying to see what she is showing me. She glides her finger slowly from one end to the other. I look at her in amazement. "One board?" I ask, unable to find a crease or a hem from hull to stern. She simply smiles. I look at her hands. Her fingers are long, like a musician's. Slender. Smooth. Not the hands I expected. Not the hands I imagined for this kind of work, for sanding and planing. A man pokes his head around the wall, eyes us attentively, suspiciously, as we slowly make our way around the entire boat. She shows me where the sail mast will rise, the setting for the wheel and rudder. We stop only once we have come full circle and are standing at the bow again. She leans her head to one side and smiles. I glance at her once then turn my gaze back to the boat. "It's beyond my means." We stand in silence for a moment. "Any others?" I ask, still eyeing the boat in front of me. She pulls me along with the sideways nod of her head. We descend the buoyant ladder, each rung giving a little with each downward climb. She reaches a hand up to my back to assist me through the final rungs, her fingers spread and pressing through my shirt as I back down into them. Her hand is strong. Direct. She opens the door directly behind us. The room is filled with machinery and long tables filled with tools. Sawdust and shavings cloud the floor. Sunlight drifts through the big windows tucked tightly beneath the roof high above us. The air is heavy here. The boat here is half the size of the other. She motions me with the pull of a finger to the far side, the side closest to the wall with the windows. Without saying a word, she points out the work, the sanding, the breaking down of old paint and water damage. She leans in again, this time I can feel the heat of her body, the cradle of her shoulder resting against mine. “When did you know this is what you wanted to do?” I ask turning to face her. She reaches and wipes away some loosened paint from the boat’s side with a slow downward brush of her hand. She lets out a short, abrupt laugh. Then breathes in. She places a hand in the small of my back and urges me forward with the other hand. We stop when we are on the complete other side. I nod slowly. I ask him how long he’s been building. As we talk, she turns and walks away, out the door we came in, without a word. I stare straight ahead, listening to her footfall over the dusty floor grow fainter until she is out of range. We talk until he is done and there is nothing left to tell me about how the contours of his life led him here. “Stop by again when you’re back on the island,” she calls down from the catwalk as I duck out. She says it without looking, staring deep into the hull. I have been totally drawn into all of these words. you actually stumbled on to what ultimately is the unifying conceit: what element is it that unites the image with the words? the narrator acts as photographer and the viewer. we enter in and experience it too. Your use of focus in the shot is amazing. And, like Chris, I loved how you get the photographer's perspective in the story. It gives the picture a different feel, as opposed to just making an opinion as a viewer. one of the reasons i chose this photo to write about was the first person perspective the viewer has of the photo. it's hard not to feel a part of the moment, too. it was my hope that the viewer felt in the room.